Mohamed Aloosh, drawings and photographs from his art workshops in Lebanon, in 'Create Syria - the future constellation', at House of Vans London, Waterloo. Photo credit: Kelise Franclemont. Part of the “Talking Peace Festival” sponsored by International Alert, “Create Syria – the future constellation” is a multi-media installation of art, music, and film designed to “explore how arts can help build a better future” for the million refugees in Lebanon affected by the ongoing crisis in Syria. From 21 September to 2 October 2016 at House of Vans in Waterloo, London, in partnership with Cult Events and GrubClub. 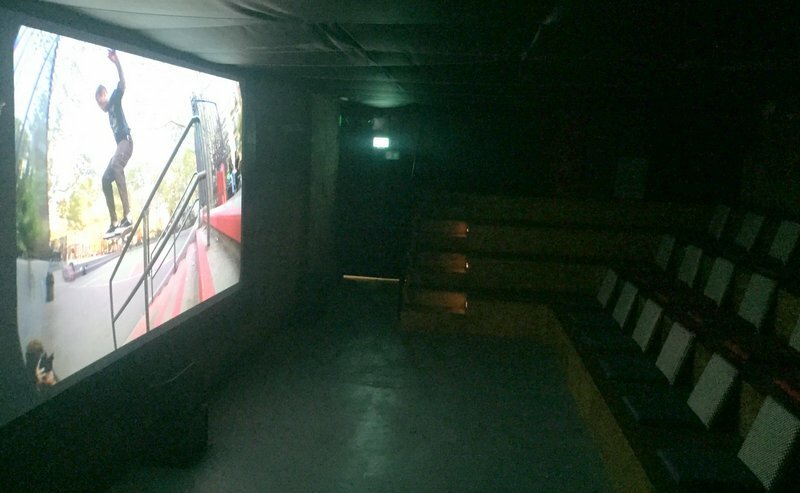 Installation view, in ‘Create Syria – the future constellation’, at House of Vans London, Waterloo. Photo credit: Kelise Franclemont. 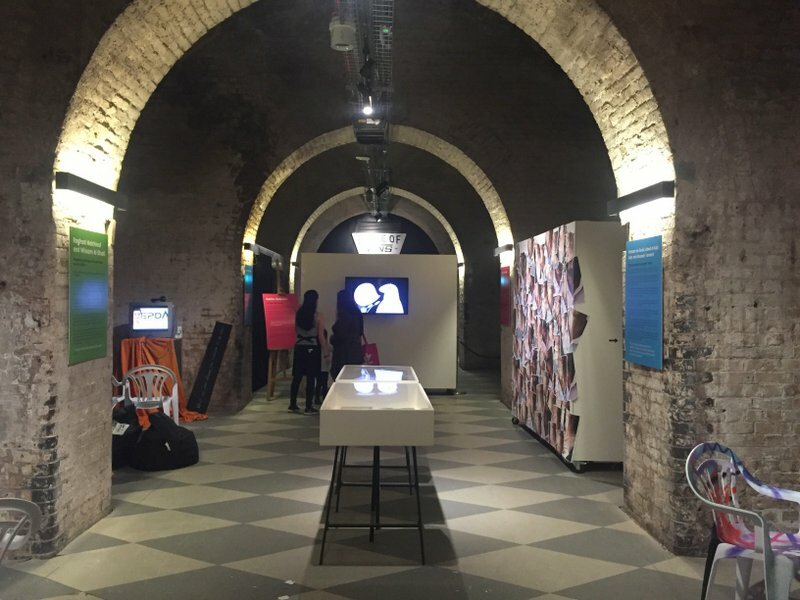 Having taken up the former Old Vic Tunnels art space in 2015, House of Vans London [HOV] at Waterloo station is a vibrant community centre with a presumed target audience of mostly young people – though clearly, skateboarders of all ages and non-skating visitors alike are warmly welcomed. Inside the unexpectedly sprawling complex, there is a cinema, an art gallery space, several cafe/bar lounges, an indoor skate park, and the “museum of Vans” celebrating all that is this essential element of skate culture. The cinema, House of Vans London, Arches, 228-232 Station Approach Road, London, SE1 8SW. Photo credit: Kelise Franclemont. The third annual “Talking Peace Festival” from 21 September to 2 October 2016, is the latest creative and cultural project at House of Vans and is put on by International Alert, an NGO founded in 1968 with the aim to “work with people directly affected by conflict to find peaceful solutions”. In partnership with House of Vans, Cult Events, and GrubClub, The Talking Peace Festival is made up of art exhibitions, talks, food, and nine free screenings of “Talking Peace Films” that “explore the cause of conflict” and highlight the world-wide struggle for peace. Another important aspect of the Talking Peace Festival project is the Conflict Cafe, which aims to harness the “power of food to break down barriers” by sharing “unique culinary experience of food from conflict areas” with a series of supper clubs featuring dishes from Lebanon and Sri Lanka. Sponsored by International Alert, ‘Create Syria – the future constellation’, at House of Vans London, Waterloo. Photo credit: Kelise Franclemont. “Create Syria – the future constellation” is an exhibition by eight artists, filmmakers, and musicians who present their current projects from Lebanon’s refugee camps. More and more like cities, these camps currently house more than one million refugees from Syria, many of whom are double-refugees from Palestine, Iraq, or Jordan who had settled in Syria and now are on the move again because of the ongoing crisis there. Among the three or four video installations in “Create Syria” is a short film of Ossama Halal’s productions of the plays “Under Zero” and “Cellophane”, both related to refugees and immigration. Establishing a “laboratory for experimental theatre” for artists from varied ethnic/cultural backgrounds, Halal runs a theatre programme for Lebanese and Syrian young people with the “hope that there will be real peace between us, human beings”. Ossama Halal, screenshot of the play ‘Under Zero’, 2016, documentary film, in ‘Create Syria – the future constellation’, at House of Vans London, Waterloo. Photo credit: Kelise Franclemont. Filmmakers Abed al Aziz Aidy, Hussein Taraani, and Karim Qabrawi provide workshops in all aspects of making videos or animation in order to allow space for young people to express themselves and “make their voices heard” as well as finding means of collaboration between Syrians with their hosts in Lebanon. Hisham al-zouki, Abed al-aziz Aidy and Hussein Taraani, ‘The camp and my parents’ story’, 2016, short film, in ‘Create Syria – the future constellation’, at House of Vans London, Waterloo. Photo credit: Kelise Franclemont. Karim Qabrawi, ‘Triangles and Squares’ (screenshot), 2016, animated film, in ‘Create Syria – the future constellation’, at House of Vans London, Waterloo. Photo credit: Kelise Franclemont. Voice is the first musical instrument a person has; it’s given by God. Barkev Taslakian, ‘Voices of Syria’, 2016, sound installation, in ‘Create Syria – the future constellation’, at House of Vans London, Waterloo. Photo credit: Kelise Franclemont. A long table in the centre of the room provides samples from Mohamed Aloosh, an artist who teaches young people essential skills in drawing and painting, which he says “helps them make friends and unlock their creativity”. 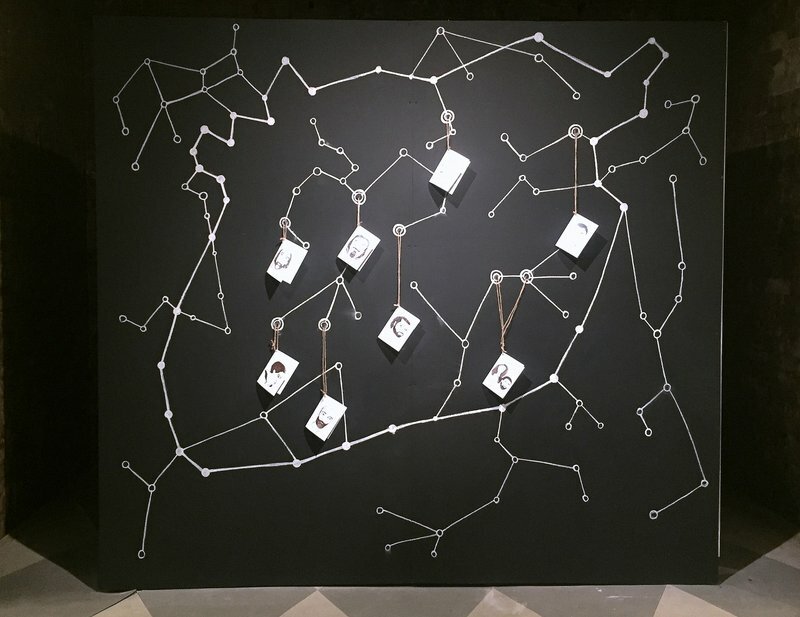 Mohamed Aloosh, drawings and photographs from his art workshops in Lebanon, in ‘Create Syria – the future constellation’, at House of Vans London, Waterloo. Photo credit: Kelise Franclemont. Detail of installation, ‘Create Syria – the future constellation’, at House of Vans London, Waterloo. Photo credit: Kelise Franclemont. In the final video, I discovered theatre-based workshops in Lebanon entitled “Empowering Dialogue through Peace and Art [EBDA]) by actress Raghad Makhlouf and photographer Wissam al-Ghati, who hope to “make teenagers dream again” by creating a safe space for these young adults to “think about the future in a positive way”. 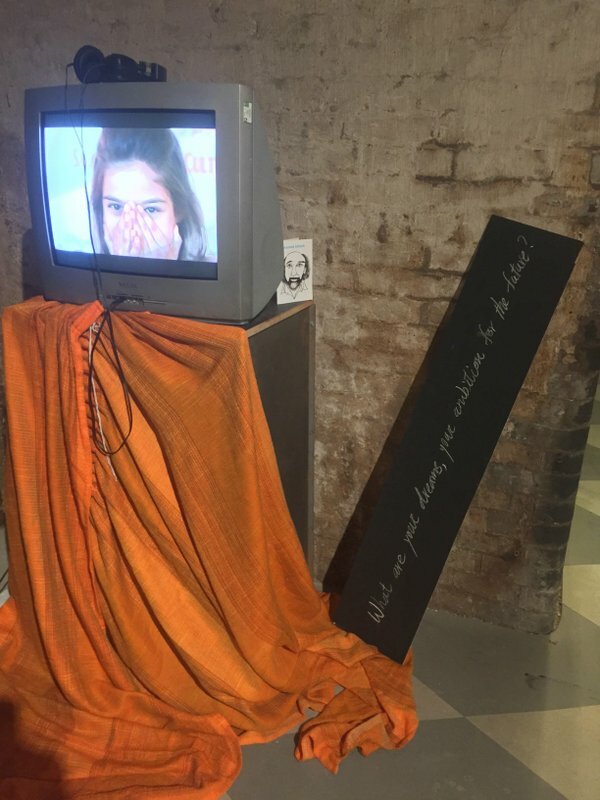 Raghad Makhlouf and Wissam al-Ghati, ‘Empowering Dialogue through Peace and Art [EBDA]’, 2016, film documentary, in ‘Create Syria – the future constellation’, at House of Vans London, Waterloo. Photo credit: Kelise Franclemont. the power of words and creativity in resolving conflict. Entrance lobby, House of Vans London, Arches, 228-232 Station Approach Road, London, SE1 8SW. Photo credit: Kelise Franclemont. The Bar, at House of Vans London, Arches, 228-232 Station Approach Road, London, SE1 8SW. Photo credit: Kelise Franclemont. Event details: Talking Peace Festival and Create Syria – the future constellation is on from 21 September to 2 October 2016, at House of Vans London under the Arches, 228-232 Station Approach Road, London, SE1 8SW. Free entry; Step-free access.